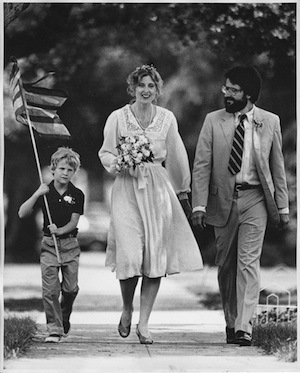 Thirty years ago today the Dawn Joggers walked along with son John from their home on Wayne Ave. in South Pasadena to Eddy Park a block away. John carried a flag that the female DJ’s mother had made for the occasion. At the Park, they were married in front of family and friends by Episcopal priest, the Rev. Cynthia Seagal Samuels. Godfather Clark had given John a rubber spider to throw at the end of the service. Why? Because he’s Clark – and John was 6. This entry was posted in Middle widow. Bookmark the permalink. I know this is not a “happy” anniversary but I’m happy for your beautiful memories. This is such a lovely photo. Thanks for sharing with us. A beautiful memory! Thanks for sharing. Linda, you looked beautiful (you radiated) – isn’t it a warm fuzzy to know you found the Right One? And look at the beautiful granddaughter that God gave you this many years later. Yours must have been a fabuous marriage, and I am happy for you. Sure, you miss him, but look around you for all the memoriesyou ahd he created together and know that he still lives on in your heart.